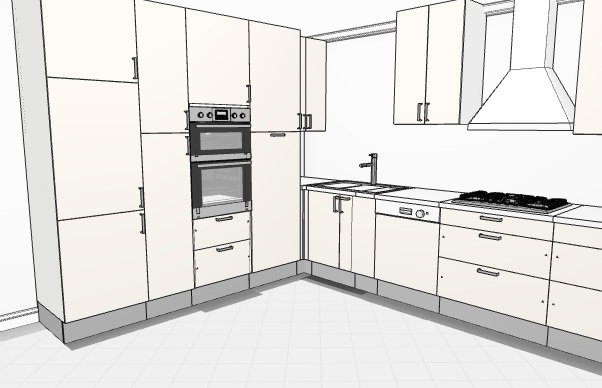 Now it's time to have a look at layout options for L shaped kitchens. 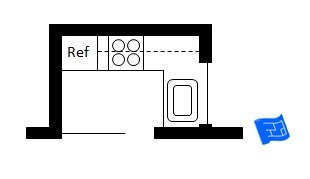 Here's a kitchen design facing into an open plan space. There's often a table in the middle. 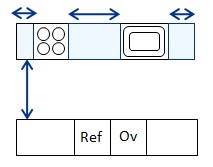 Read more about table clearance. There's also some L shaped kitchens with islands to look at. 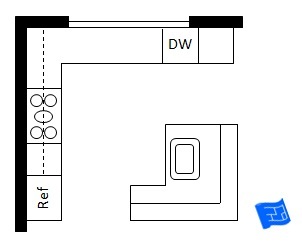 Here's a kitchen layout with one side of the L shape with full height cabinets. 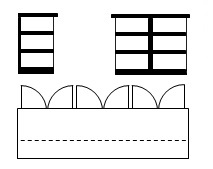 So how long does each part of the L need to be to include part of the kitchen triangle on both tails of the L? 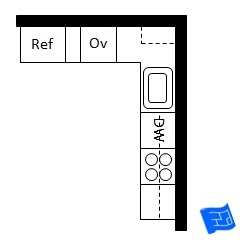 A room with a run of at least 96 inches (8ft / 2.44m) for one side of the L and 36 inches (3ft / 92cm) on the other side will allow each tail of the L to accommodate an element of the kitchen triangle in a standard size. 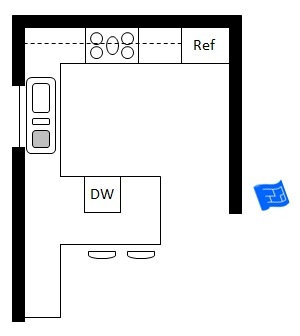 This happens to be very close to the recommended clearance for a run of units opposite a wall, otherwise you’ll have a galley kitchen design with a small tail for extra counter space and storage. Another way of incorporating this kitchen is to build it into an alcove with pocket doors. 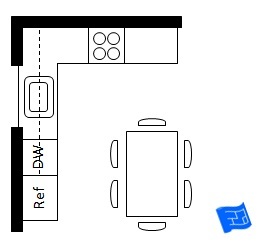 That way you've got an open plan kitchen when the doors are open, or a self-contained kitchen with the doors closed. There's enough room to work in the kitchen with the doors closed as well. I guess these are really L kitchen designs with L shaped islands. Here's a simple arrangement where the L shaped island doesn't house any part of the kitchen triangle. Here's a similar arrangement with a slightly bigger island which accommodates the sink comfortably and includes a bar height section on the island to provide visual privacy. 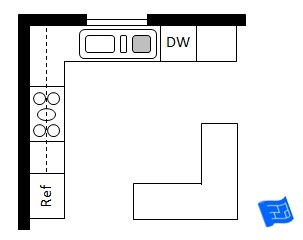 The kitchen layout below is handy if you want the entrances to the kitchen to be opposite each other. 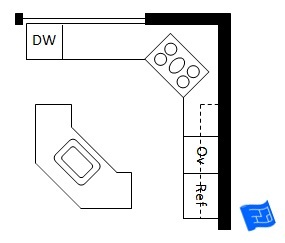 Here's a kitchen layout with elements of the kitchen triangle orientated at 45°. 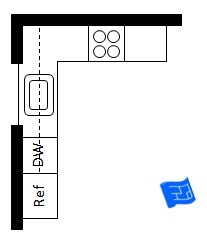 We’re getting into cloudy terminology now – is this a broken L with a kitchen island, or a broken U, or a galley kitchen with an island and an extra run of units? 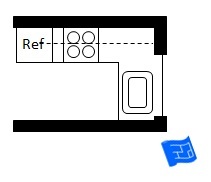 The kitchen triangle should be kept to the runs of units facing each other. On the 'spare' run of units this arrangement has the usual base and wall cabinets with counter space. You could go for full height or three quarter height kitchen cabinets as well. 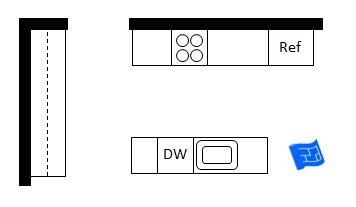 Again - the terminology is a bit cloudy here as this could also be described as a U shaped kitchen with an extra few cabinets on the end. I think the extra bit would make a great desk area - a place to have the laptop and do a bit of paperwork while keeping an eye on the cooking. Counter space can be at a bit of a premium, particularly if the L isn't very big. You could look at using an under the counter refrigerator to free up a bit more counter space, or if there's room, make it a kitchen with an island. If the kitchen table is nearby it doubles up well as extra counter space during preparation. Storage space can be hard to come by in small L shaped kitchens, particularly if there's not many wall cabinets. Again adding an island helps to solve this problem or try some of these kitchen storage ideas. There might be room for a free standing dresser or credenza to supplement the storage. 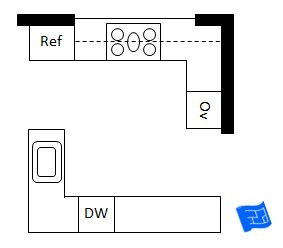 Provided that the rules of thumb for kitchen triangle dimensions are followed the layout will function well. If you have a big kitchen don't be tempted to space things out - keep the kitchen triangle compact in one area of the kitchen and just enjoy the rest of the counter space. 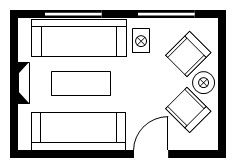 The L shaped kitchen is one of the least private kitchen designs when there's no island. Someone's idea of kitchen privacy hell might be someone else's idea of conviviality.